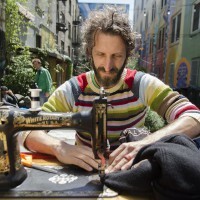 Michael Swaine mends clothing of locals in the Tenderloin National Forest the afternoon of April 15, 2012. Swaine comes out once a month and offers his services to mend clothing for anyone who needs it. Photo by Gil Riego Jr. Photos by Gil Riego Jr.
Michael Swaine sits behind an unusual looking cart in the middle of the sidewalk, as he mends clothing for free every month in a district of San Francisco that needs the most mending of all: the Tenderloin. With his brightly striped sweater that hangs loosely over a neon green shirt and brown pants, his artsy persona shines through kind eyes that hide behind long grayish brown hair and an unshaven beard. Not only is his style quirky, but so is his wooden cart on wheels. It is complete with a vintage sewing machine attached precariously to the top, while a growing pile of jeans, shirts, sweaters and jackets hang over the edge, and await his expertise. The 40-year-old mends for the people on the 15th of every month – his cart has a permanent home in the crime ridden neighborhood. His pride and joy – a century-old sewing machine – was left on the side of Grove street and rescued by Swaine, it was soon brought back to life. With money earned from an art show at The Luggage Store, a non-profit artist run multidisciplinary arts organization, Swaine bought wheelbarrow wheels and built his trademark wooden cart. Afterwards, he spent ten days slow-pushing the wooden cart seven miles throughout San Francisco – stopping to sew things along the way. Co Founders/Directors/Curators Darryl Smith and Laurie Lazer of The Luggage Store run the Tenderloin National Forest at 509 Ellis Street. Smith and Lazer offered their alley as a home base for Swaine’s services nearly ten years ago. Smith respects and appreciates Swaine for all he has done over the years and is glad to have played a part in Swaine’s mending project by providing a permanent location for the “roaming tailor.” Although the Tenderloin National Forest was just starting out when Swaine came around, Smith envisioned it to be a residency space for artists. Smith reached out to the mender and encouraged Swaine to park his project there. Since then, Swaine has established a steadfast relationship with the Tenderloin and a intimate connection with all the people who stop by his cart. “His work is amazing, and to commit to something like that and stay true to once a month for so many years without ever missing is truly admirable,” says Smith as he runs around and looks for the perfect angle to photograph Swaine for the gallery’s website. Swaine will mend nearly anything residents bring him throughout the day, whether it be hemming pants, attaching buttons and zippers or sewing shut holes in torn clothing. Not only does he provide a helping hand to those in need, but an understanding heart and open ears to the stories people share with him. Swaine gives them a companion for those few short hours he works on their belongings. He returns month after month, and works from 11 a.m. until the sun begins to set. Although he only had the intention of doing this for 6 months, it has turned into 10 years. Swaine receives much of the material for his project by donation, but he often has to buy black thread on his own because it is constantly running out. “But I’ve got too many buttons. Ten years of button donations has left me with a huge pile.” He spends his days teaching classes at the California College of the Arts with a degree in Fine Arts. Minh Vuong, a stylish Vietnamese immigrant who has lived in the Tenderloin for about ten years, sits on one of the fold-out metal chairs against the wall, and waits for Swaine to finish patching a hole in his faded black jeans. 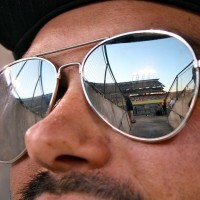 Vuong’s eyes are shaded from the vibrant sun beneath Ray Ban aviators as he adjusts the sleeves of a bright orange and green flannel button up, and sweeps strands of his peppered black hair to the side. Veronica, a small middle-aged woman with a short brown bob, sits near Swaine while donning a matching multi-colored striped sweater. She bites into a petite pear, and offers a piece of fruit to people nearby. She intently watches him mend a pocket on a faux-fur-lined coat that a resident just dropped off. “I think it’s a good thing he does. I don’t see too many people out here giving free services anymore,” Veronica says of her friend. “Veronica here is my PR person,” Swaine chuckles. She faithfully returns every month to keep him company during the long hours of mending. Because of Swaine, the city has compromised on the initial arrangements with Smith, who is the leaseholder of the space. He gestures towards the rows of carefully nurtured flowerbeds, vibrant murals, and a small wooden shack holding countless artist’s photographs contributed over the years. A few locals who are sitting on one of the added benches enjoy the rare sunny day, and glance over at the commotion that Swaine is attracting to the otherwise tranquil, quiet forest. 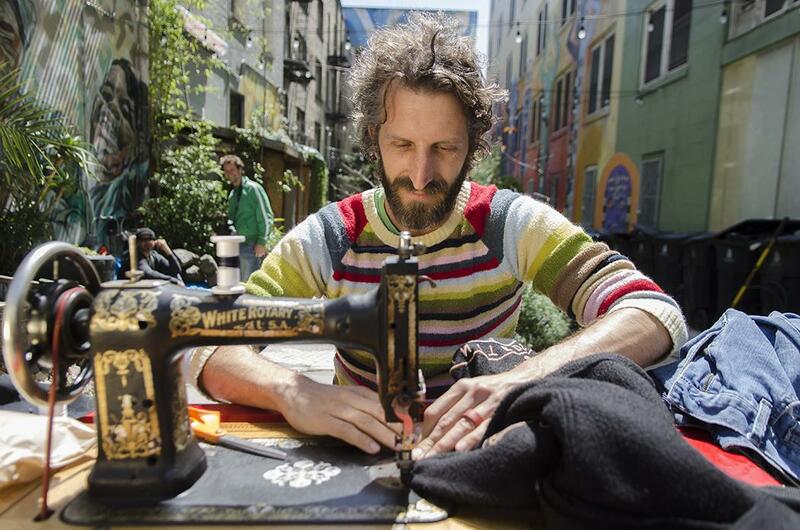 The artsy, energetic founder says he realized Swaine’s impact on the community when people would keep their things to be sewn and repaired instead of getting it fixed immediately. They save it until the 15th of every month just to be with Swaine, to see him and engage with him. The Tenderloin is congested with free services – medical, housing and meals – but the free services Swaine offers is different in the eyes of many. And so Michael Swaine will continue to return to the Tenderloin month after month, never knowing quite what to expect but the intrigue for what the day will hold and the profound satisfaction from giving back in the public sphere – for helping people he can now call friends, is enough to satisfy the dedicated mender. I would like to thnkx for the efforts you have put in writing this site. I am hoping the same high-grade web site post from you in the upcoming as well. Actually your creative writing skills has inspired me to get my own site now. Really the blogging is spreading its wings rapidly. Your write up is a good example of it. Youre so awesome! I dont suppose Ive read through nearly anything similar to this before. So pleasant to find any person with some authentic feelings on this subject. realy thanks for starting this up. this web page is something that’s desired online, anyone using a minimal originality. handy work for bringing anything new towards the internet! I enjoy what you guys are up too. This kind of clever work and coverage! Keep up the amazing works guys I’ve incorporated you guys to my own blogroll. I appreciated the exceptional article. Thank you pfofollsncc, I have recently been looking for details about this subject for ages and yours is the best I’ve located so far. certainly, investigation is paying off. So pleased to have discovered this article.. So content to get located this publish.. certainly, investigation is paying off. Adoring the contribution.. thanks Is not it terrific after you discover an excellent article? Fantastic thought processes you might have here.. I value you expressing your point of view..